The rain finally cleared and we were able to carry on our journey towards Cairns. First stop; Townsville. 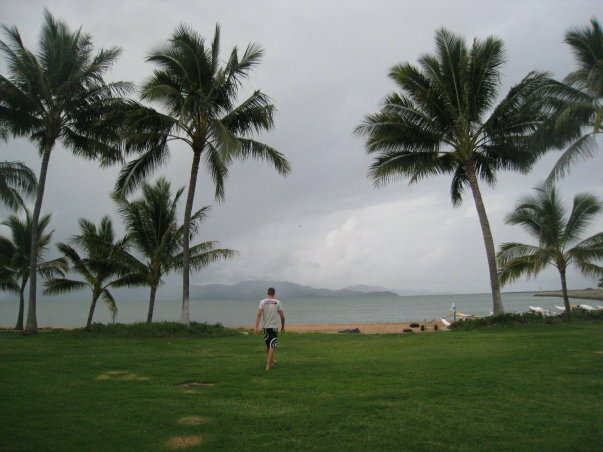 We soon discovered that there wasn’t all that much to do in Townsville – there was a lagoon, a few shops, a cinema and not much else. Having said that, it seemed to be just what we needed after the tension in Agnes Water and we made the most of the next few days relaxing. Now almost half way through our month long trip up the East Coast, reality started to set in and I began thinking about my imminent departure and not with an altogether happy outlook. The thought of going back home filled me with dread, not least because I couldn’t help but wonder what would happen to Rich and me – I was heading back to Manchester and him to Leicestershire. Though not exactly a million miles apart, it would certainly be a difficult transition after spending every day together for the past seven months. We arrived at our beachside hostel – Base, just in time for another downpour. The location couldn’t have been more idyllic, but with the weather looking a little glum, there wasn’t all that much to do. Having already had a few relaxing days in Townsville, we were eager to head out and explore so we decided to hire out a car for a couple of days, allowing us to truly take in the whole island. We headed up to the Magnetic Battery – an observation and battery post left over from the Second World War. Luckily, the rain had cleared by the time we set off on our ascent and so we were able to enjoy the fantastic view we had at the summit; overlooking Horseshoe Bay and beyond. 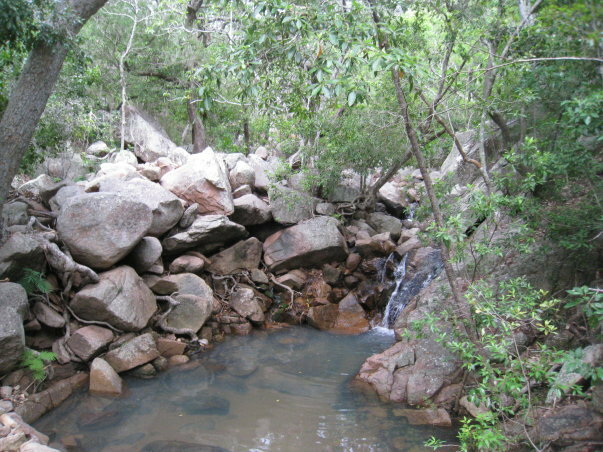 We’d read about a ‘must-see’, ‘amazing’ waterfall on the island so we planned to head there next to cool off after the hilly walk. When we finally stumbled across the waterfall, we were a little disappointed with the hyped-up description, until we discovered the rope swing! After a day or two on Magnetic Island, we had discovered pretty much all there was to see and so headed on back to Townsville to board the Greyhound to Mission Beach. We arrived on 13th February – the day before our first Valentine’s together and checked in to the Absolute Backpackers hostel. We headed into the ‘town’ to choose our cards and presents and soon discovered that the town mainly consisted of a supermarket and not all that much else. Not to be deterred, we each chose our cards and then headed for a walk around the rest of the town to see if we could find somewhere for our ‘date’. When we arrived at the window, I barely had a second to comprehend what I was about to do before the instructor was making a move for the open air. After the initial terrifying and literally breath-taking first few seconds, the adrenaline kicked in and I screamed with joy – the view was stunning. I was 14,000ft in the air looking down at THE GREAT BARRIER REEF! I can’t even put into words how amazing an experience it was. As I landed on the beach, I ran up to Rich and shouted “I want to do it again!” For the rest of the afternoon, I buzzed with excitable energy. Back at the hostel, we got chatting to some English guys by the pool who were all heading to a beachside bar that night. Rich and I had planned on heading out for a romantic meal but I could see that Rich was keen for a night out with the boys so we decided to join them instead. With only a couple of weeks left of our adventure, we were determined to make the most of every moment. Romantic meals could wait, it was time for fun! The next day, a little worse for wear, we climbed aboard the Greyhound for our final journey to Cairns. We quickly discovered on the East Coast that not everywhere described in the Lonely Planet as being a ‘backpacker must-see’ was actually all that impressive. 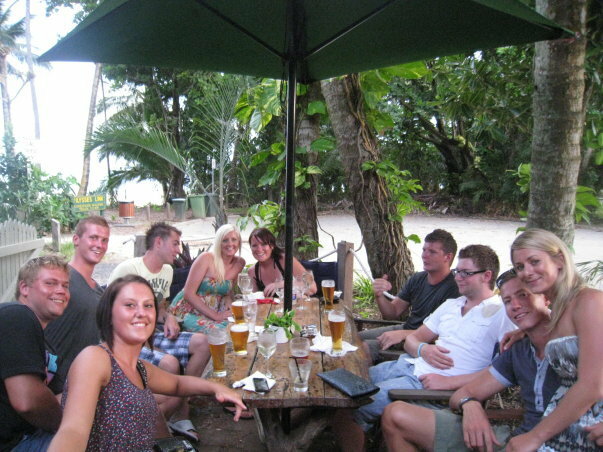 Talk to other backpackers about things to see and do rather than relying solely on the guide books. Having said that, don’t just take other people’s word for it; venture out and do the discovering yourself! Hire a car and head out on the open road, forget the map and just stop wherever takes your fancy. Do a skydive – you won’t regret it!